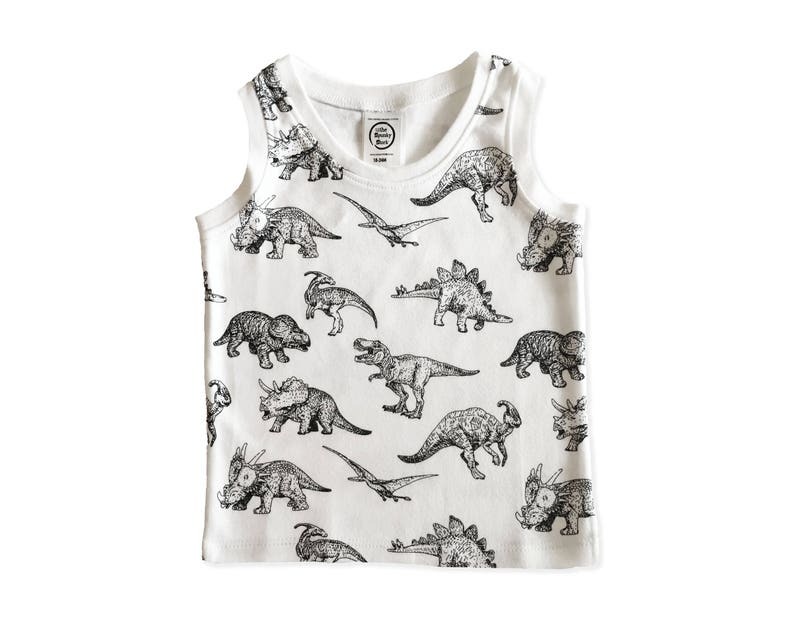 Super soft and adorably unisex, our monochrome dinosaur muscle tank tops make the perfect outfit for lounging or hitting the town with Mom & Dad. Fast shipping! Beautiful PJs! I will buy another set next year for sure. They are super soft. I monogrammed my little girls name across the front in Gold. Everyone wanted to know where I got them. so cute! can't wait to gift it. Why do you only offer items in white? Our baby & toddler shirts are our own Spunky Stork brand of 100% GOTS certified cotton, and we only manufacture them in white... BUT if you are set on wanting another color - like grey - we can certainly accommodate you. Just start a convo with us. What does GOTS certified mean? GOTS stands for Global Organic Textile Standard. It's the highest level of organic cotton certification there is. Only organic cotton that meets certain environmental and toxicological criteria can be considered 100% GOTS certified. Most of the adult t-shirt flat measurements can be accessed within the picture gallery of each listing. For measurements on baby bodysuit & toddler tees, please visit http://spunkystork.com/size-chart. We are happy to make your design dream a reality! Need shirts for a birthday party? Family reunion? Special baby shower bodysuit? We've got you covered. Just start a convo with us to learn about our affordable (starting at $4) custom design add-ons. We print every single item to order, so it takes us 1-3 business days until an order is ready to ship out. But, if you need something by a certain date, please let us know. We can accommodate 99.9% of all rush requests! !